Sculptor Peter Fagan (1939- ) created this bronze sculpture. Spanning 6 feet high, the artwork is displayed in the Beckman Institute for Advanced Science and Technology rotunda. It was acquired as a gift. Arnold 0. Beckman, born a blacksmith's son in Cullom, Illinois, in 1900, earned his B.S. degree in chemical engineering at the University of illinois in 1922 and completed his master's degree in physical chemistry the following year. He received his Ph.D. in photochemistry from the California Institute of Technology in 1928. While teaching at Caltech, he formulated and produced an ink to end the problem of clogged postal meters, and in 1935 he invented the pH meter, a portable measuring device that launched his career as an important inventor and manufacturer of scientific instruments. These include the quartz spectro-photometer, which automatically analyzes chemicals; the ultracentrifuge, used to measure the density of chemical substances; and the protein sequencer, which has helped unravel the mysteries of DNA. In 1982, his multi-billion-dollar international company, the giant Beckman Instruments, Inc., merged to form SmithKline Beckman Corporation. Devoted to philanthropic causes, Dr. Beckman and his wife, Mabel Beckman, gave the university $40 million in 1985 to build the Beckman Institute for Advanced Science and Technology. With supplementary funds supplied by the state, the structure opened in 1989. Grants for research at the center are awarded by corporations, foundations, and the federal government. The university and the state of Illinois cover operation and maintenance costs. The institute is the largest and most ambitious university-based multidisciplinary research facility in the United States, focusing on broad problems in the life sciences and the physical sciences. Its programs extend from biochemical, molecular, and cellular studies to cognitive science. Programs in the physical sciences and engineering range from efforts to synthesize new materials with potential application in information-processing devices, to studies of artificial intelligence, robotics, and computer vision. 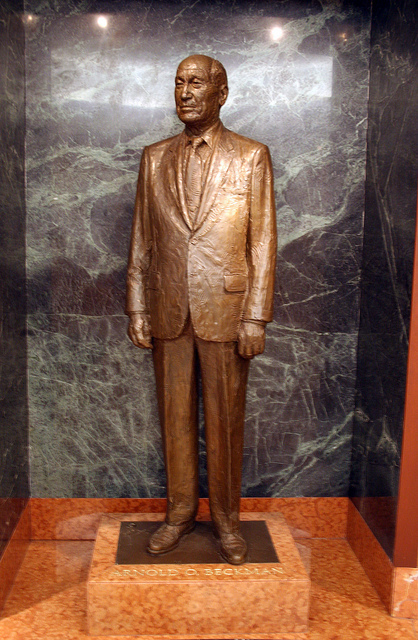 Peter Fagan made this life-sized bronze statue of Dr. Beckman from the more than 160 photographs he took of him in 1987. He remembers him as "a very nice, modest man; he was sort of embarrassed by the idea of the sculpture." lmpressed by Beckman's presence in the room, Fagan believes he successfully "captured his character, his aura. He commanded space, just as a sculpture commands space." A member of the university art faculty since 1967, Fagan has designed and executed a number of major commissions, among them the bronze and concrete Raptor 5 for the North Point Marina, Mt. Zion, Illinois; three monumental bronze figures comprising the Illinois Workers Memorial, on the state capitol grounds; an over seven-foot-high polished bronze crucifix for Holy Cross Church, Champaign, Illinois; and the full-size bronze statue of Chicago mayor Richard J. Daley, in the Illinois state capitol rotunda. Muriel Scheinman, “Arnold O. Beckman, 1988,” ExploreCU, accessed April 21, 2019, https://explorecu.org/items/show/9.